No one is going to walk into “Rampage” looking for high art. Which is good, because no one will find it. Instead, what you will find is a largely by-the-book action movie loosely based on a video game, complete with a predictable script, thinly-written characters and, in the latest example of a disturbing trend, one stomach-churning, misogynistic death. Also, there are giant animals. The substance rapidly evolves the DNA of its host, leading to aggression and substantial growth, and causing the affected animal – a wolf, say, or a crocodile – to take on aspects of other species. George remains pure gorilla. Again, inconsistent. As the animals are mysteriously drawn to Chicago, summoned by radio wave – just go with it – Okoye and a former CRISPR scientist (Naomie Harris) set out to find the antidote, and stop the hellish creatures before they flatten Wrigley Field. Frankly, the Cubs have been through enough. The number of screenwriters who worked on a film is often a measure of how bad a script is, and “Rampage” credits four. Although Johnson and Harris have a quippy chemistry that largely overshadows their characters’ flaws, the story also includes a shadowy government figure – how could it not? – played by Jeffrey Dean Morgan. The character is such a cartoon Texan – boasting a pearl-handled revolver, an impressively large belt buckle and Lone Star swagger – that Hank Hill would find him a bit much. And we know Malin Akerman plays a villain because her character wears really high heels and somehow manages to change into a cleavage-baring red dress before fleeing her office in terror. Director Brad Peyton hits all the expected beats: You can set your watch by the fight scenes. Sometimes, he hits them too often. At least twice, video monitors go to static when cameras – or the people wearing them – get eaten by beasts run amok. Peyton has clearly studied mediocre action movies, and it shows. 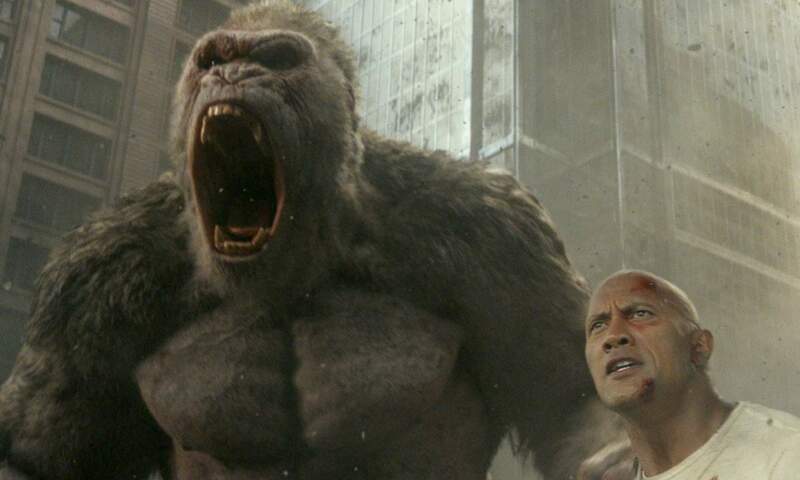 The defining feature of “Rampage” is, of course, the creatures. George and the giant croc get the most bang for the CGI buck. The wolf is less well-defined, and therefore less impressive. But there’s a problem: Although the animal abominations get the most attention – rightfully – it seems that very little of the budget went to any other special effect. We can live with fewer crocodile teeth if it means that the plane crash looks at least somewhat realistic. It’s all about choices. At times, “Rampage” almost hides its problems. It’s just funny enough, just exciting enough and just visually impressive enough. What it never is, though, is anything more than just enough.